This odd-looking bug was found on Seep Baccharis -- Baccharis salicifolia near Bumble Bee, Yavapai Co., Arizona. Identification was made by A. Hamilton. There are many kinds of plant hoppers. As adults they possess two pairs of membranous wings that are sometimes colored or even have a coating of waxy hairs in which case they might be mistaken for a moth. They feed with piercing-sucking mouth-parts on plant sap. They attach to plants either above or below ground and take only liquid food but can withdraw and jump away with powerful hind legs as necessary. Some species are quite specific in their food choices, selecting only a few closely related plants upon which to feed. 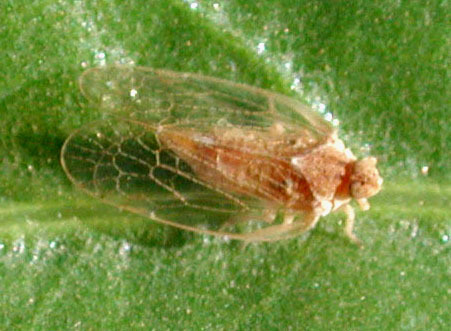 Some are important pests of crops and may be involved in disease transmission. It is by no means certain that this species has a trophic relationship with Seep Baccharis -- Baccharis salicifolia. Further field searching is needed to locate more adults, or preferably immatures. Readers are encouraged to submit their findings. Seep Baccharis is found only in riparian habitats in the Sonoran Desert, and so too is this bug.